What we have omitted to mention in the above, is that we started off by making yesterday’s focaccia recipe with four of the Orange House residents. 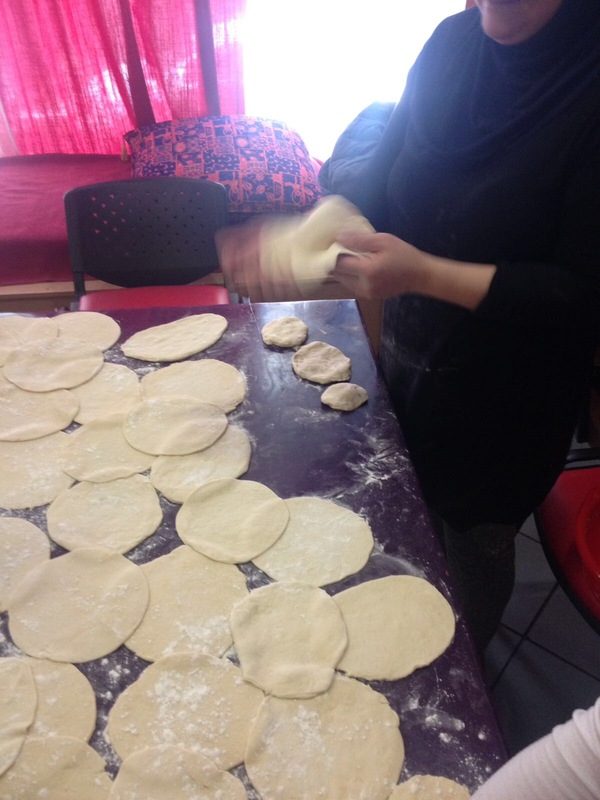 Once the focaccie were ready to go in the oven, and the juzmuz underway, we suggested that one of the ladies teach us how to make Syrian flatbreads to accompany the traditional juzmuz. This is how we ended up with 45 flatbreads and four large focaccie – or, more accurately, four large focaccie, 20 Not Syrian flatbreads and 25 Italian-Syrian flatbreads. To explain, halfway through baking our Syrian flatbreads, we were halted by one tutting resident who informed us that these were “not Syrian breads” but Italian pizza, suggesting that we sprinkle the remaining dough with herbs and garlic instead. 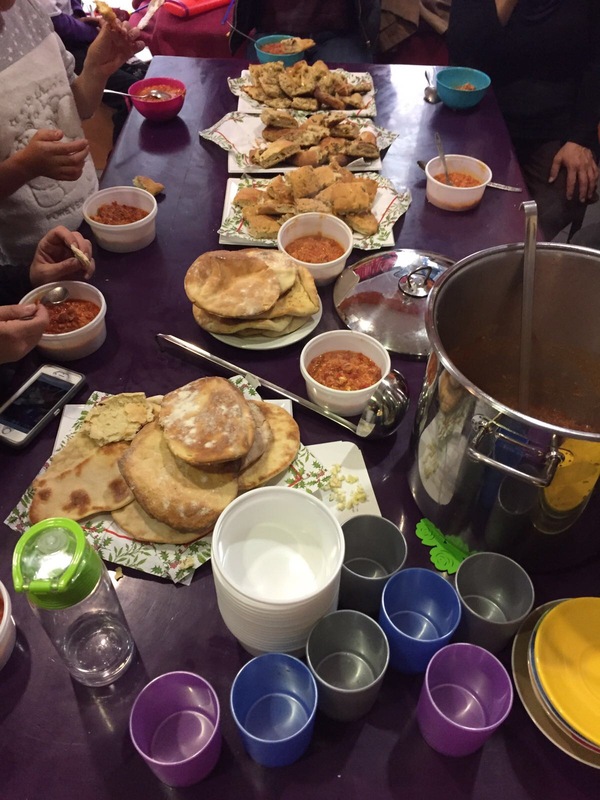 Despite this, everyone agreed that the breads made perfect juzmuz spoons and delicious snacks throughout the afternoon. 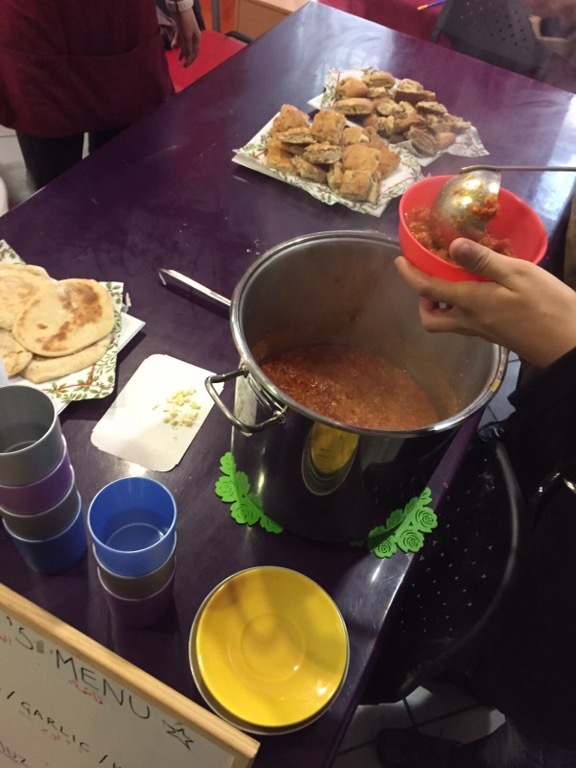 As for the juzmuz, it was delicious and a wonderful first taste of traditional Syrian cuisine, although one visitor did inform us that he would have scrambled the eggs before adding them to the tomatoes, to which Sabah replied, “next time you can cook for us, then”. He smiled back and happily tucked into seconds.